What’s the secret to a comfortable reading nook? In our opinion, lots of soft pillows! 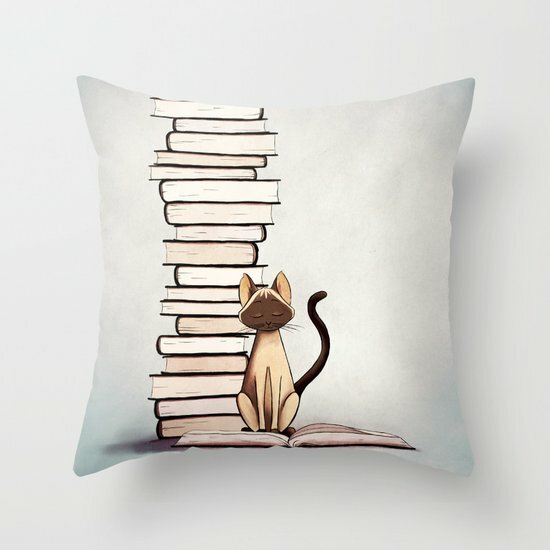 Throw pillows don’t have to be a solid color, nowadays several creative artists have come up with great bookish throw pillows that add style and sophistication to your reading nook. 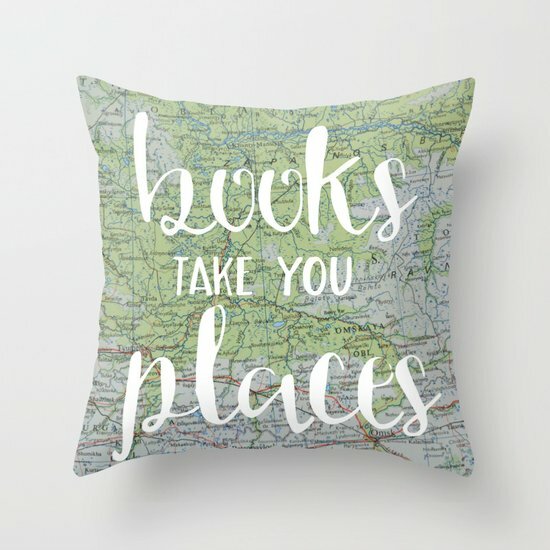 If you are looking for some new decorations to add to your reading nook, consider these bookish throw pillows that will add a touch of whimsy and give you something to smile about every time you curl up with a good book. Curl up in your reading nook with this beautiful design by Evie Soe. It captures the way we readers like to spend our days off perfectly, doesn’t it? With a fictional world full of fictional characters. Preferably with a blanket of some kind. Something can be said for the quiet sentimentality of an illustrated library. 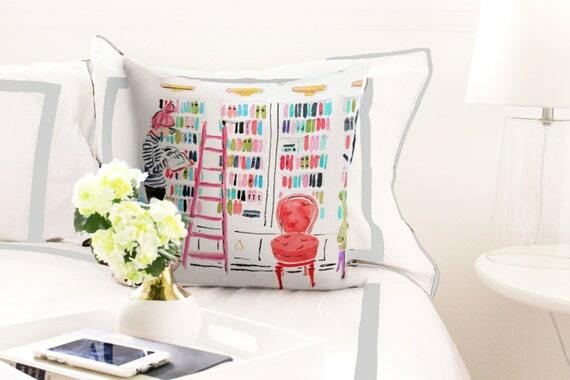 This artful pillow from A Thing Created will provide a tasteful accent to your reading nook. Plus, doesn’t it just depict the home library of our dreams? A room dedicated to books with a ladder so that we can peruse the high shelves at your leisure? What’s the point if you don’t use it? 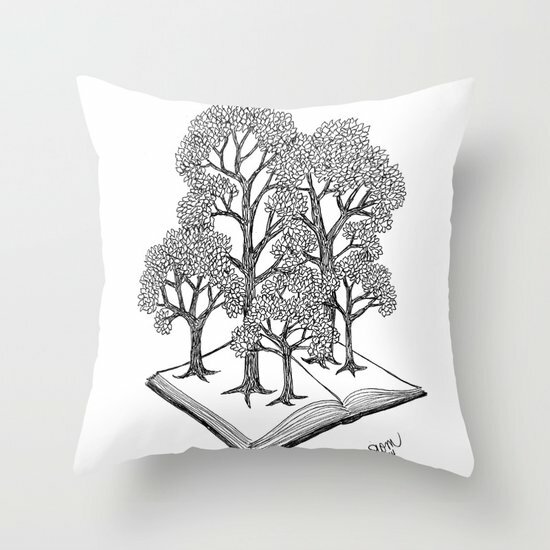 Relax in your reading nook with this beautiful pillow from Belinda Designs. 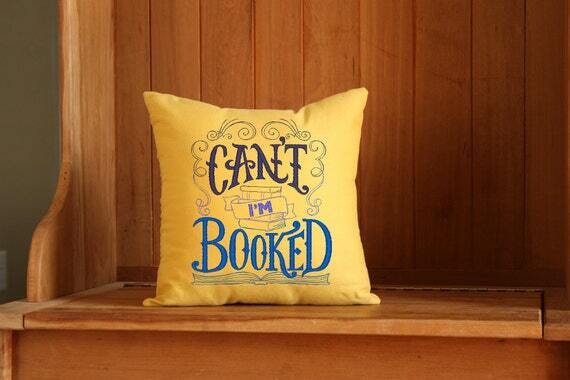 Belinda Lee Briggs creates these embroidered pillows with this tongue and cheek saying that is essential to any book lover. 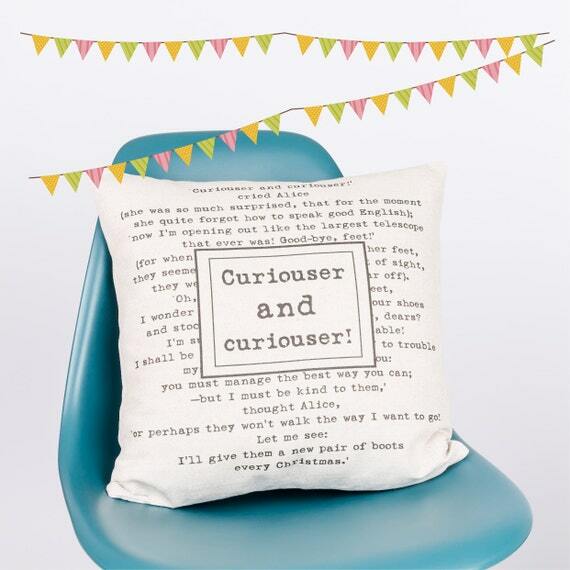 There are times when the perfect bookish throw pillow is one that just adds a touch of whimsy to your space. 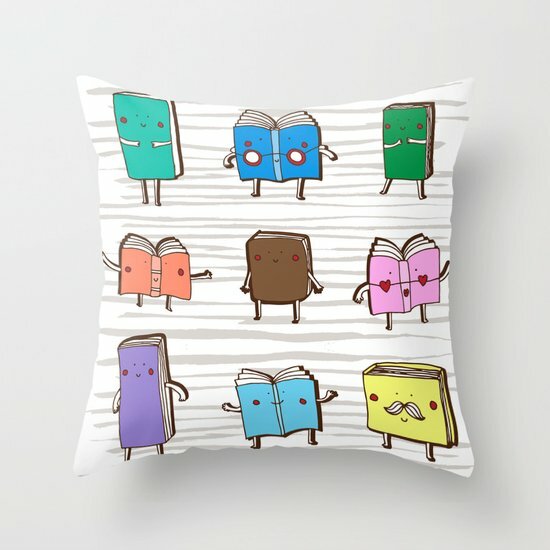 Here is a throw pillow by Little Red Cheeks that depicts books talking. Isn’t that just adorable? Want a simpler touch of the classics to cozy up with? Haleigh DeRocher of Sweet Sequels designed this pillow based on the cover of the book’s first edition published in 1897 and the pillow is hand painted on high-quality cotton. As a bonus bit of irony, this book was the Bible of home decorating until the early 1900s. See if any of your book club guests pick that up at your next meeting. There is a reason that great quotes endure. 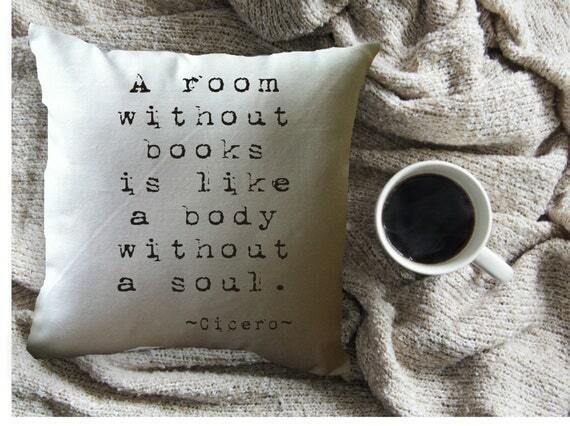 Cicero was right when he said that a room without books is like a body without a soul. The simple design of this pillow from Minnie and Maude is ideal for curling up in your reading nook. Sometimes when a book makes you feel “all the emotions” you don’t want to talk, you don’t want to explain what’s wrong, and you definitely don’t have the energy to explain your inability to form words with non-readers. 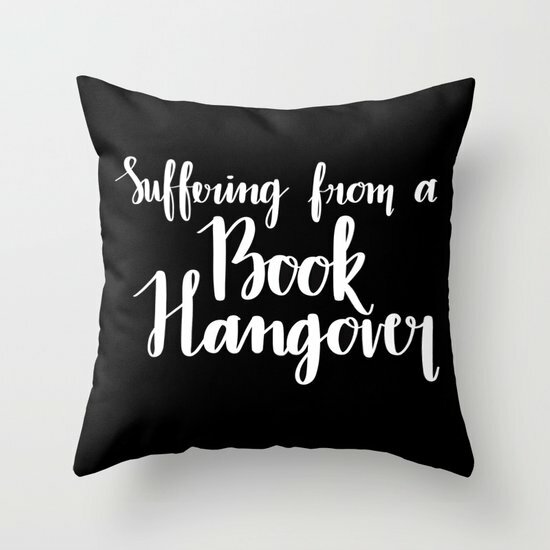 That’s where this pillow by Aimee Reads a Lot comes in. Stick it in your reading nook and you’ve finished that book that is leaving you hungover, hug it to your chest and display the text to anyone who asks what’s wrong. 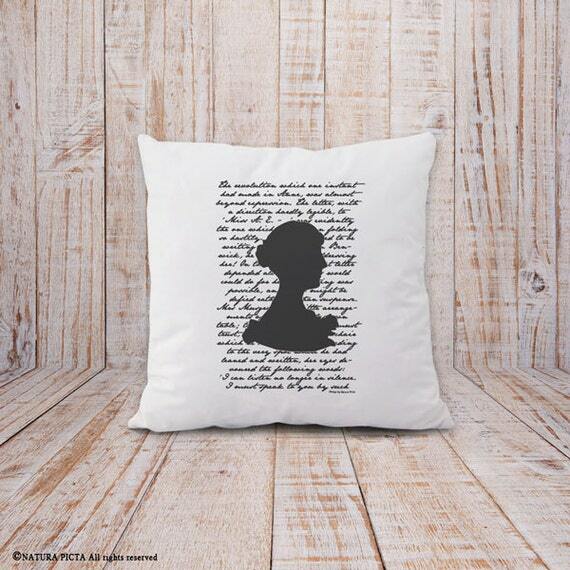 An absolute must for anyone who loves to curl up with Jane Austen’s classic novels, this pillow from Natura Picta depicts the author’s silhouette and some ornate text behind her. The mountain of books that is your TBR pile can make you feel like you’re running out of time. This duo of bookish throw pillows by Make In USA perfectly captures the feeling of having too many books and too little time. Reading takes our imaginations to new heights. The Book Forest design from Shannon Messenger is a beautiful depiction of this sentiment. The design will provide an understated touch to your reading nook but still be inspirational whenever you sit down for a reading session. 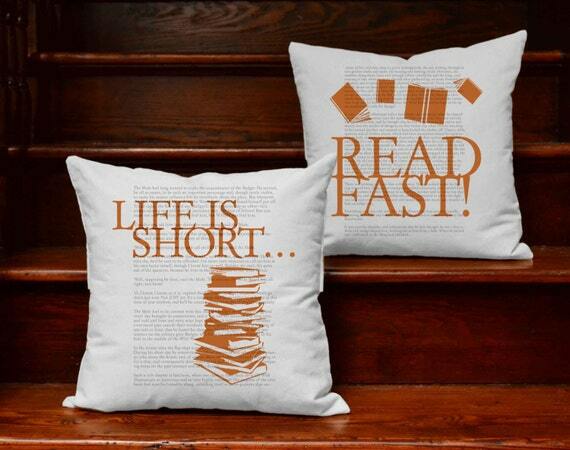 If you want a reminder to make more time for reading then you’ll love this design by Maisao. It will be a reminder to “Seize the Book” every day. “Curiouser and Curiouser” is a quote that embodies the mind of a reader. 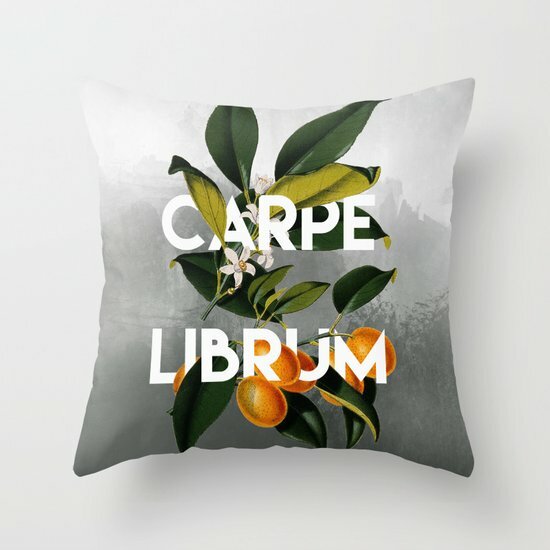 This text-based bookish throw pillow from Vintage Designs Reborn will fit into your reading nook perfectly. Nothing goes better with a pile of books than a cat. The Reader is a beautiful design by Naomi VanDoren featuring a reading cat and a pile of books. Be careful, or that cat may take over the world one day. Sometimes all you really want is a simple design. This rectangular pillow features a line drawing by Nuf Nuf Creation and it’s the perfect simple design for your reading nook. What would a reading nook be without a little touch of Harry Potter? 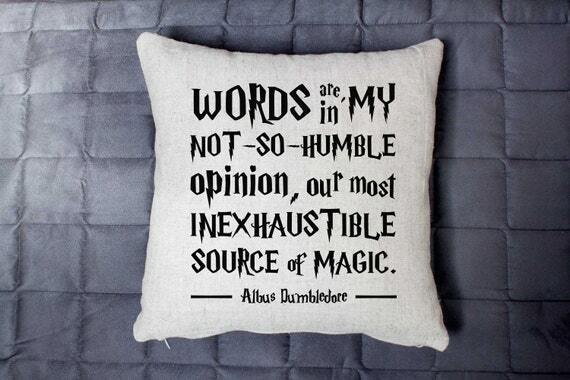 This Albus Dumbledore Quote pillow from LT Spirit, while not about books themselves, does talk about the magic of words. Considering how books can transport us, that’s kind of the same thing. Right? 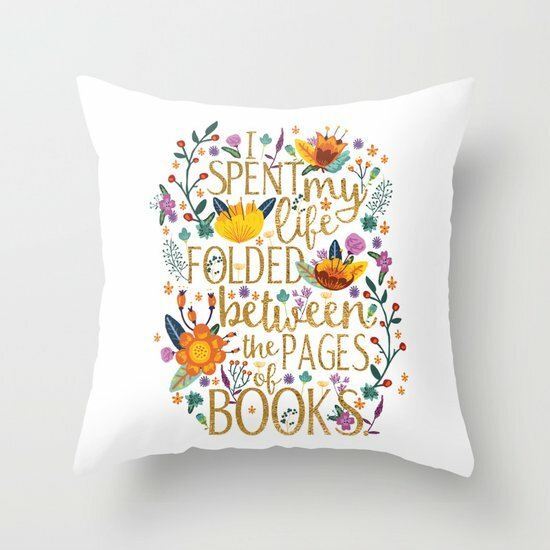 This common quote to an illustration of a woman curled up with a book is a beautiful addition to your reading nook. 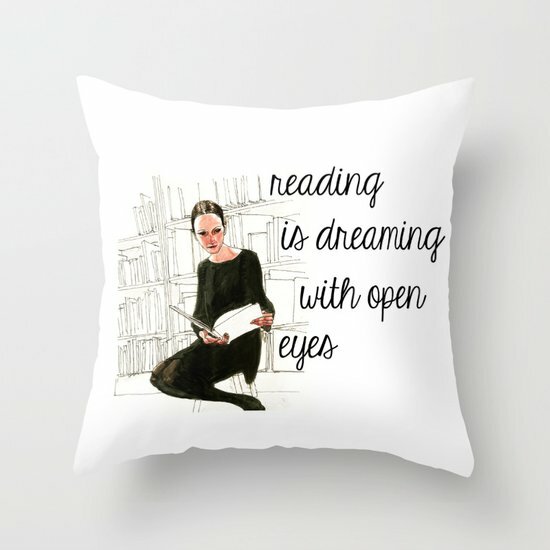 Designed by The Book Lover’s Guide, the “Reading is Dreaming With Your Eyes Open” perfectly captures the love of reading. 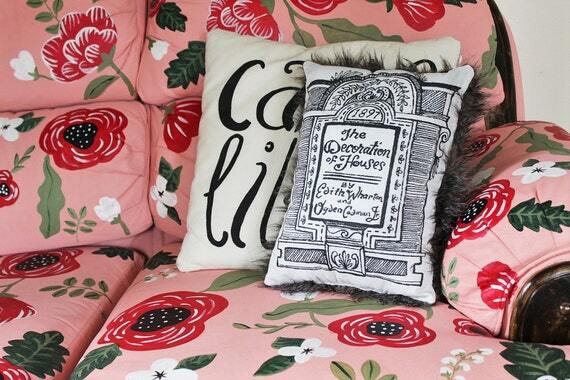 All of these pillows designed by independent artists make us want to curl up in the corner with a book. 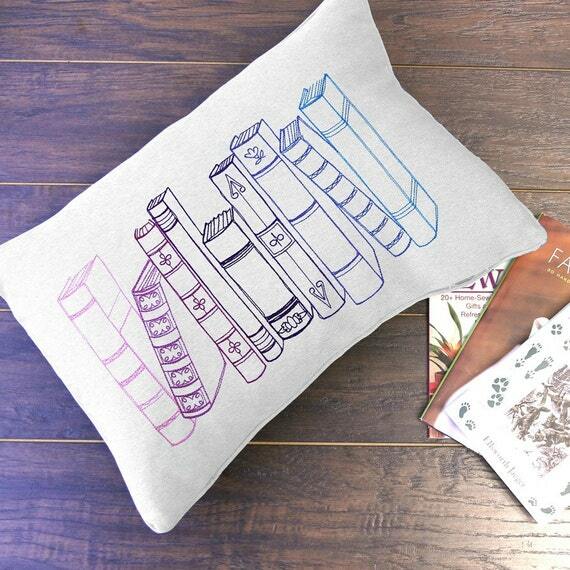 Which of the bookish throw pillows above is your favorite? Let us know in the comments below.